There’s nothing more terrifying than a hissing mass of black and white feathers charging you on your way to class. 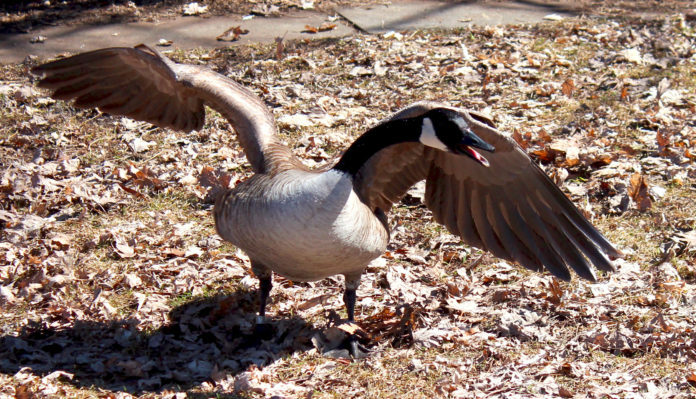 Spring term marks the beginning of the Canada goose mating season, a time of fear for staff and students alike. If you see geese in places where a nest would cause a nuisance, such as near the entrance of a building, the Toronto Wildlife Center advises chasing them away. The goose will remember that the area is unsafe and move somewhere out of the way to nest instead. “Their population could double every three to five years,” Bill Dowd, President and CEO of Skedaddle Humane Wildlife Control said. Once these birds have their nests established, the best way to keep yourself safe from a potential goose attack is to avoid the geese entirely. Campus-goers can download the free app uWaterloo GooseWatch on their phone to take a gander at the locations of all the known goose nests around the campus, then plan your path to avoid them. If you spot a nest not currently marked on GooseWatch, report it on goose-watch.uwaterloo.ca. “Be aware that they’re around, aware of where their nests are and stay as far as you can,” Dowd said. Sometimes you simply can’t avoid an encounter with these awful avians. Don’t worry, there are a few steps you can take to reduce the chance of a tumble with these feathered fighters. First, watch for the warning signs. Geese will generally makes shows of aggression before attacking. These consist of bending their head straight back, stretching their head fully forwards, hissing or honking, and finally pumping their head up and down before they attack. movements as a sign of aggression. Geese prefer to attack from behind, so if one decides to charge you, it’s best to keep both your face and chest pointing at it. If worse comes to worst, stretch your arms out to either side to make yourself look at large as possible, then back away slowly and be careful not to trip on anything as falling gives the goose a perfect excuse to attack you.